The USS Harry S. Truman (CVN-75) keel was laid on 29 November 1993 at the Newport News Ship Building and Dry Dock Co. in Newport News, VA. On 7 September 1996 Harry S. Truman was launched, sponsored by the late President's daughter, Margaret Truman Daniel. After fitting out post-launch, four years and eight months after her keel was laid, CVN-75 was commissioned USS Harry S. Truman on 25 July 1998, under Captain Thomas Otterbein. CVN-75 was named for Harry S. Truman (1884 - 1972) was the 33rd President of the United States. Truman became President upon the death of Franklin D. Roosevelt on April 12, 1945. World War II in Europe was nearly over, with Nazi Germany succumbing in less than a month to the Allies of the United States, Britain, France and the Soviet Union. The war in the Pacific was far from over with the fear that an invasion of the home islands of the Japanese, with their code of fighting until death, with cause unimaginable carnage and a million plus casualties to the Allied Forces. President Truman, to avoid the great loss of life, ordered the dropping of an atmonic bomb on Hiroshima, Japan on 6 AUG 1945, and called for the Japaneses to surrender. The Japanese made no reply to the call for surrender and a second atomic bomb was dropped on Nagasaki, Japan on 9 AUG. The Japanese surrendered, formally signing on the USS Missouri on 2 SEP 1945. The USS Harry S. Truman is the eighth of ten Nimitz-class nuclear powered aircraft carriers. Her two nuclear reactors drive four steam turbines, which in turn spin four 25 foot diameter propellers. Harry S. Truman has a flank (top) speed of over 30 knots. With unlimited range, her nuclear reactors will be refueled just once, at the approximate half way mark of her projected 50 year service life. After shakedown, flight deck certification and underway training from late 1998 throught the better part of 2000, USS Harry S. Truman departed for the Med and Indian Ocean in November 2000. After six months supporting Air Operations over Iraq, she returned to Norfolk, VA in May 2001. December 2002 had Harry S. Truman underway for the Mediterranean. From the Eastern end of the Med, her warplanes again flew war patrols over Iraq. She returned to Norfolk in May 2003. After five years in commission, Harry S. Truman entered Norfolk Naval Shipyard in August 2003 for a six month planned maintenance period. Beginning in February 2004 Truman conducted a series of post ship yards trials and certifications culminating with a Surge Deployment to the Mediterranean in June and July 2004. USS Harry S. Truman departed on her third Med-Indian Ocean deployment in October 2004. She transited the the Suez Canal at night on the 11th and 12th of November and then spent nearly five months in the Indian Ocean supporting the Allied effort in Iraq before returning to Norfolk in April 2005. Hurricane Katrina crashed in to Louisiana and Mississippi on 29-30 August 2005. 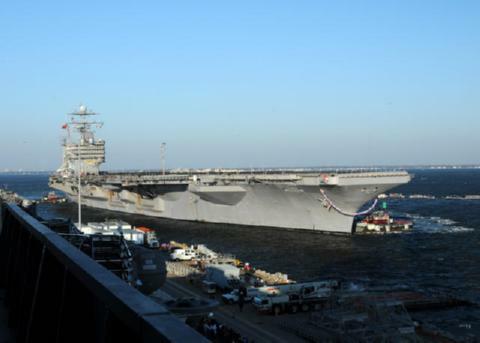 USS Harry S. Truman departed Norfolk, VA on September 1 to assist. Helicopter Anti-Submarine Squadron Seven Five (HS-75) flying from Truman performed rescue operations over the city of New Orleans. USS Harry S. Truman provided aid and material assistance to the stricken area until retuning to Norfolk in October 2005. USS Harry S. Truman spent nearly the entire year of 2006 in the Norfolk Naval Shipyard for planned maintenance and upgrades. Early 2007 had Truman progressing through the post-ship yard shakedown, training and certification cycle prior to deployment readiness. In the midst of the period, on February 22, the Secretary of Defense, Robert Gates visited the Truman and addressed all hands over the 1MC. On 15 August 2007, an E-2C Hawkeye crashed moments after taking off from USS Harry S. Truman. All three crew members of the Hawkeye, a command and control plane of VAW-120 GRAYHAWKS, were killed. USS Harry S. Truman again deployed in support of Operation Iraqi Freedom in November 2007. While at sea in the Indian Ocean Truman recorded her 75000th carrier landing without a mishap. She returned to Norfolk in June 2008. Entering Norfolk Naval Shipyard in August 2008, Truman spent seven months under going planned maintenance, including a once every ten year reactor process, before returning to sea in February 2009. 2009 and early 2010 brought the cycle of training and joint operations required to prepare Truman and her Strike Group for deployment. She sailed on May 21, 2010 to the Med and then through the Suez Canal on June 20, 2010. On 7 November Truman recorded her 100000th carrier landing. Truman, and her strike group, consisting of Carrier Air Wing 3, USS Normandy (CG 60), USS Winston S. Churchill (DDG 81), USS Oscar Austin (DDG 79) and USS Ross (DDG 71) returned to Norfolk on December 20, 2010.